Helsinki. Highly developed own strategies and culture are needed for external collaboration in ecosystems. This is one of the key highlights from the panel discussion we arranged last week as part of EEX Alumni & Partners event. We put together very "grounded" panel, all panelist work directly on ecosystems from different perspectives. Thus, these are more reflections of practitioners than academic truths – overall it’s still early days of understanding how to play in global ecosystems. In the panel we had Mikko Huumo, Development Manager, Startup and Fund Investments, Fortum Plc., Päivi Juolahti, Director, Head of Fazer Lab, Fazer Group, Jukka Salmikuukka, Head of Ecosystem Business, New Services and Solutions, Kone Corporation Plc, Susanna Perko, Senior Specialist, Government External Economic Relations Unit at Finnish Prime Minister's Office, Jyrki Sarasti, Head of Ecosystems, Nokia Plc. (Pictured from left to right, author last). "Only way to achieve that diversity and speed is through ecosystems"
We had different ideas of what an ecosystem is. It seems we can work with tentative definition that goes something like "network of business entities who have aligned strategic interests, who have decided to work together, who all bring to the table something useful for the others and who all gain something from the collaboration." Note: This does not necessary imply a single unified goal, nor single set of collaboration modes. Also, experiences vary: where Fazer has just launched a bold initiative to establish a Nordic Foodtech Ecosystem, e.g. Nokia has been working for years with number of parties, including competitors, in establishing telecom industry standards – quite fundamental ecosystem work. Nevertheless, Nokia is now re-learning the ecosystem game due to IoT and digitalization of the industry verticals beyond their traditional customers, the operators. ► Ecosystems are the way to tackle increasing complexities and ever-faster changes. Ecosystem cooperation may be demanding but those who don’t play will risk being left behind. Reactions become too slow and expensive. Only way to achieve the needed diversity and speed is through an ecosystem. Jukka remarked how Kone’s business domain ("people flow" in buildings) is getting more digital, smarter and integrated, and that even a large company cannot handle all this complexity on their own. Furthermore, he pointed out that while in a large corporation it is possible to think outside-of-the-box, it can often be very difficult to do outside-of-box things. For this you need startup partners. Overall, ecosystem needs diverse partners and we can and probably should include competitors as well, "keep enemies close" as Mikko suggested. He also noted that we should set ambition level high enough and not be happy with only the startups that we meet in daily business, but reach out through global hubs for most interesting partners. 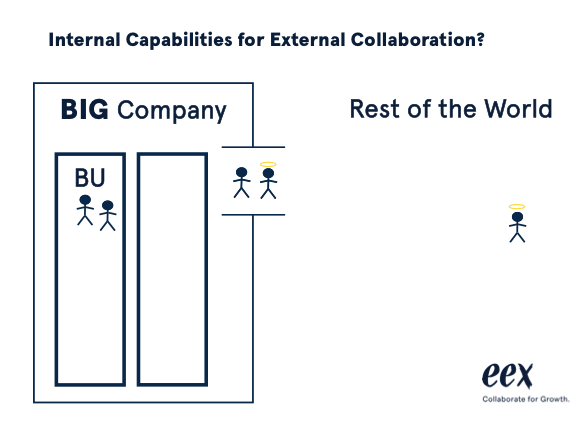 ► Internal systems and capabilities must support external collaboration. External collaboration starts from within. How to get large company’s internal silos to work effectively with outside world? (see the picture) One can always establish a separate unit for open collaboration, venturing and startup activities at the edge of large company, but this is not enough. Staffed with star players understanding both corporate and startup world, this unit is seen as the bridge between the company and outside world. However, real big business is done in large business units, which are tightly run and usually very focused in their current business. How do we effectively link the outside innovators with internal units in proactive manner? We also need to ensure that business units (silos in big corporations) get continuous support for startup collaboration. Companies need to work hard their internal systems and competencies in order to play effectively with diverse partners through ecosystems. Fazer is establishing an internal network of Champions. Päivi emphasized importance of these internal "ambassadors of open innovation," people who take the message into the business areas. Others told about similar arrangements, and overall we did agree this is an area that will require lots of work. The whole company needs new skills in order to succeed in ecosystem collaboration. ► Reciprocal value propositions. 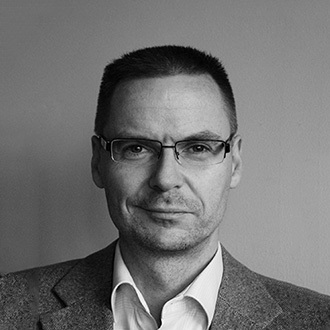 Tero Hottinen from Cargotec challenged the panel to discuss about how to build two-sided value propositions (win-win); these could be different for external and internal audiences. Venturing or startup unit’s motivation for collaboration can be different (e.g. tech foresight) from business unit’s motivation (e.g. something new to sell, think typical KPIs), and naturally different from the startup’s reasons for cooperation (e.g. paid pilot!). The big company’s startup team needs to interpret and match the opportunities between all these parties. It’s important to keep in mind that in general for ecosystem to work everybody has to bring something to the table and everybody has to gain. Value proposition to a potential partner requires understanding also partner’s strategy and mutually beneficial opportunities. Amidst increasing competition even the biggest and finest corporations need to have solid value propositions to attract the small innovative partners to play with them. Often these are built around helping with access to customers, accelerating time-to-market, or helping with industry expertise, especially with cross-industry partners. ► Every relationship starts with trust. Mikko stressed that ecosystems are people business, people-to-people collaboration that requires high levels of trust. Openness needed for trust is tricky, you need to be ready to share your strategies with your potential partners in order to find mutual ground, create alignment and common vision. We all agreed on that and Jukka pointed out the link to corporate culture and how difficult it is to change. Openness requires good command of one’s own strategy and future options throughout your own organization. Simply enough: your potential partners need to understand your strategy in order to be good partners, so get your own stuff together and be open about it. We also touched the role of the government. Susanna’s point was that government should be enabler, not the primus motor or driver of ecosystems – this should be left to passionate individuals. There is another "school of thought" that advocates more proactive role for government overall, even that the government should take (quasi) entrepreneurial role (See e.g. Mariana Mazzucato, Timo Hämäläinen). At least in theory there are huge opportunities in government and private sector working together for business and societal goals through ecosystems. The sectors are highly intertwined throughout our societies, and new solutions e.g. for so called wicked problems will require novel partnerships that could stretch across borders and sectors. 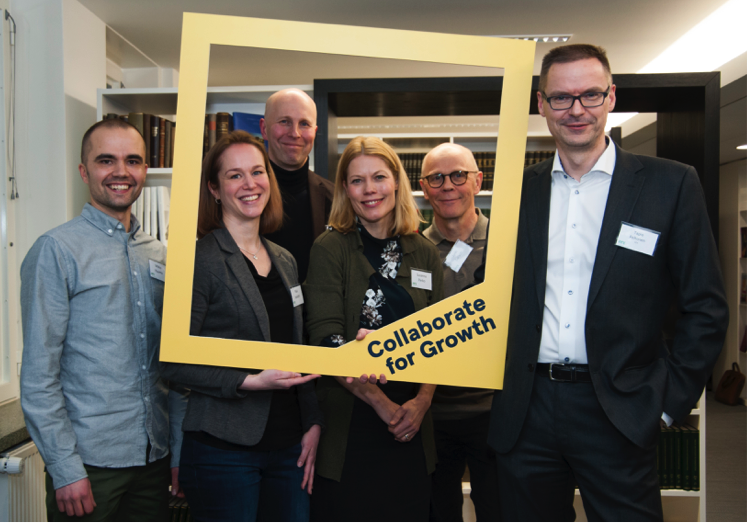 "…the new skills, whole company needs to know to play"
Finally, for a small open economy like Finland, it is imperative to collaborate globally at the forefront of the key networks to sustain innovation and knowledge-based growth. Much learning, in my view mostly "learning by doing" is needed. To build and keep up the momentum we should support each others’ initiatives, and rally others support as well, or in Susanna’s words: "Keep going and get your senior managers to say 'YES'!" Big thanks to our great panelists! Special thanks to Samuli Simojoki of Borenius Attorneys for hosting us. Many thanks also to our 100+ audience of growth and innovation doers, especially for the insightful questions. Looking forward to seeing you all in the next event!